Jakarta, Indonesia – The Food and Agriculture Organization of the United Nations (FAO) Emergency Centre of Transboundary Animal Diseases (ECTAD) Indonesia reinforced its commitment to support the prevention, detection and response to emerging pandemic threats in the country under the Emerging Pandemic Threats Phase 2 (EPT-2) programme, funded by the U.S. Agency for International Development (USAID). On 18-19 July 2017 at the Coordinating Ministry of Human Development and Culture (Kemenko PMK), Jakarta, FAO participated in the third Annual Emerging Pandemic Threats Strategic Planning Meeting co-hosted by USAID and the Ministry. 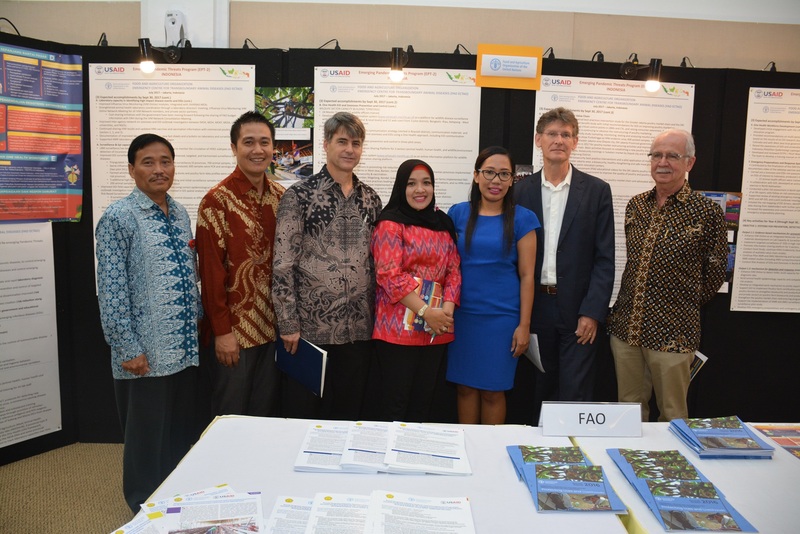 “As part of the EPT-2 programme, FAO is working closely with the Government of Indonesia through the Ministry of Agriculture (MoA), the Ministry of Health (MoH) and the Ministry of Environment and Forestry (MoEF), as well as USAID’s other EPT-2 partners. We seek to build further capacity to address Emerging Infectious Diseases (EIDs), focusing on EID risk mapping and risk management, using the One Health approach. Integrated control of avian influenza, action on Antimicrobial Resistance (AMR), and public outreach using a well-defined EID communication strategy are also key components of the FAO EPT-2 portfolio,” said Dr James McGrane, FAO ECTAD Indonesia team leader. The Strategic Planning Meeting was held to strengthen coordination between USAID, its EPT-2 partners and Government of Indonesia’s line ministries in achieving the goals of the EPT-2 programme. At the event, FAO presented its accomplishments to date, including strengthened capacity building at eight Disease Investigation Centres of the MoA’s Animal Health Directorate to detect key EID viruses and improved coordination and collaboration on the application of the One Health approach to control AMR, endorsed by five ministries - Kemenko PMK, MoA, MoH, MoEF and the Ministry of Marine Affairs and Fisheries. Through USAID, the United States partners with the Indonesian Government as well as organisations including FAO and the World Health Organization (WHO) using a One Health approach that addresses human, animal and environmental sectors. EPT-2 will help Indonesia combat newly emerging diseases. Indonesia plays a vital role in regional and global initiatives to prevent and control infectious diseases and pandemic threats. The country is uniquely situated in a hot spot region for emerging and re-emerging infectious diseases due in part to high levels of interaction between people and animals. Since 2005, Indonesia has been carrying out critical work on avian and pandemic influenza and is now expanding to EIDs and Global Health Security. “In the prevention, control and response to zoonotic and EIDs, the application of a coordinated and synergized collaborative, multidisciplinary and cross-sectoral approach, including collaboration with international agencies and donors, are crucial aspects to ensure success,” said Deputy Minister of Health Improvement from Kemenko PMK, Dr Sigit Priohutomo. EPT-2 works across sectors with Kemenko PMK and several other ministries to ensure alignment and complementarity with Indonesia’s strategic development goals. Under Indonesia’s leadership, EPT-2 promotes examples of how different sectors can work together under a One Health umbrella to address public health threats that can significantly impact animals, humans, and the economy.